One could easily argue that the “Burnout” series provided gamers with something they had been asking for since the emergence of 3D driving / racing titles, namely – a real sense of speed and danger as well as satisfying crash dynamics. 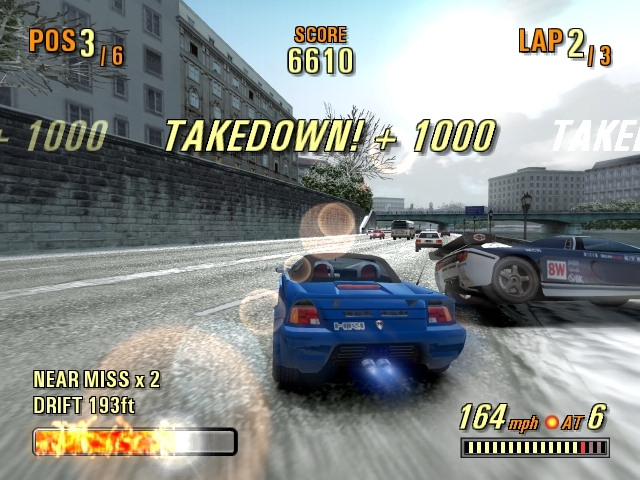 In short, “Burnout 3: Takedown” achieves all of these aims and more, adding additional components to complete the picture. Needless to say, Takedown received quite a lot of critical praise upon release and it’s not tough to see why. It’s a very graphically-appealing title first of all, and one that actually manages to break some new ground in various areas at the same time. There are not one or two, but five different modes, in fact. They are split along the more conventional racing / crashing lines, with 2 devoted specifically to actual racing while the remaining 3 pertain only to pulling off crashes. You’ve basically got Race, Time Attack, Road Rage and Crash $, each one corresponding to a different mechanic that should be fairly familiar by now. There are actually 173 different events herein, with no less than 60+ vehicles to unlock and even a rather primitive online mode allowing several players to participate on a single course together. Simply put, all the elements required to turn a good game into a great one are present, with all the variation in content just adding icing to the cake, as it were. The way the developers expanded things with the “takedown” mechanic, which provides benefits for those who can avoid having rival team members wreck their rides (as well as points for dealing the damage) was a particularly inspired inclusion. 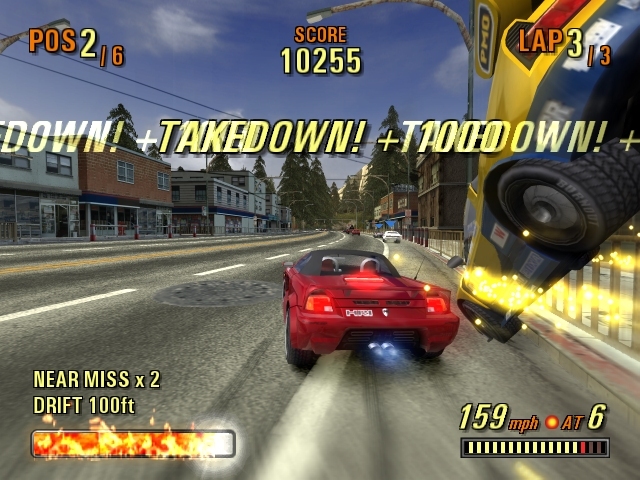 Again however, perhaps the biggest single selling point of “Burnout 3: Takedown” is probably its graphics, which are pretty spectacular, especially for a PlayStation 2 era title. There’s always a lot of information being hurled at you, often while you’re racing along at seemingly face-melting speeds. It is this sense of urgency and unbridled aggression which helps to make the game into something truly unique – a hybridized title of sorts. Likewise, the environments / levels themselves often include very nice backdrops which add a sense of depth and texture that helps to generate a certain sense of realism in the midst of very unrealistic action. It’s also worth pointing out that the controls are really quite easy to master and respond wonderfully as well, which again, lends a lot of credibility to the title’s gameplay. While most might approach this game from the perspective of a pure racer, they’re very quickly going to get sucked into exploring what it has to offer in terms of carnage. The multi-level racing experience “Burnout 3: Takedown” provides is at once competitive, fun and also brutal in its vehicular violence. In the end you’re left with a game that remains appealing to both conventional racing fans as well as those on the lookout for a fresh take on familiar formulas.